There is flying, and then there is tailwheel flying. Tailwheel, also known as “conventional gear” or "taildragger" is like going back to the early days of aviation, when flying was pure and equal parts art and skill. More than that however, tailwheel flying allows you to truly master all of the skills you’ll need to be a fully proficient pilot. Located half the year in New England and the other half in Central Florida, Learn Tailwheel will give you a great tailwheel experience. And for entry level pilots, "Captain Paul's Flight School and Tailwheel Academy" is our foundational flying school and a great place to start. Private pilot training in a tailwheel aircraft with Paul Santopietro will teach you the key fundamentals you'll need to become a safe proficient pilot. teaching you to fly is what we dO. helping you learn tailwheel is what we love. Paul Santopietro was born to teach flying. In fact after having his first lesson, he was so taken with being in the air that he completed his private pilot’s license in just 13 weeks. Fast-forward 30-some years and he now has more than 20,000 hours as a pilot with more than 12,000 of that in tail wheel aircraft. His ratings are almost as numerous as his PIC hours including ATP, Commercial Glider, Single Engine Land, Single Engine Sea and he’s a CFI, CFII and MEI. He has flown many aircraft types and ferried planes all over the country and Mexico. When you’re training with "Captain Paul" you know you are flying with someone vastly experienced and deeply proficient. It’s also quickly apparent that he loves to fly and to teach flying, especially the important nuances that are an integral part of tailwheel flying. If you're ready to learn tailwheel, Paul is ready to help. During the warm months, from May to October our operations move north to New Endland on the island of Martha’s Vineyard. It’s hard to imagine a more beautiful place to learn to fly tailwheel. Flight operations are located at the amazing grass field of Katama Airpark (1B2), nestled near the Atlantic Ocean to the south and Katama Bay to the east. At Katama we offer private training in tailwheel aircraft as well as tailwheel endorsements in the Citabria 7GCBC as well as check-outs in the classic L-19 Bird Dog. With the long summer days, there are plenty of hours for flying and we can schedule your sessions to fit your schedule. Some pilots arrange their training to coincide with their summer vacations, while others book a more intensive daily schedule, with training as the main goal for being on the island. Either way, you will love the experience flying above this beautiful island and her surrounding waters. When the weather turns cold up north, our flight operations move south to the warm and inviting Central Florida coast, specifically the Daytona Beach area at our home base, Massey Ranch Airpark located in Edgewater. Just miles from the Atlantic coast, Massey Ranch Airpark (X50) is a great field for beginning your training or getting your tailwheel endorsement. 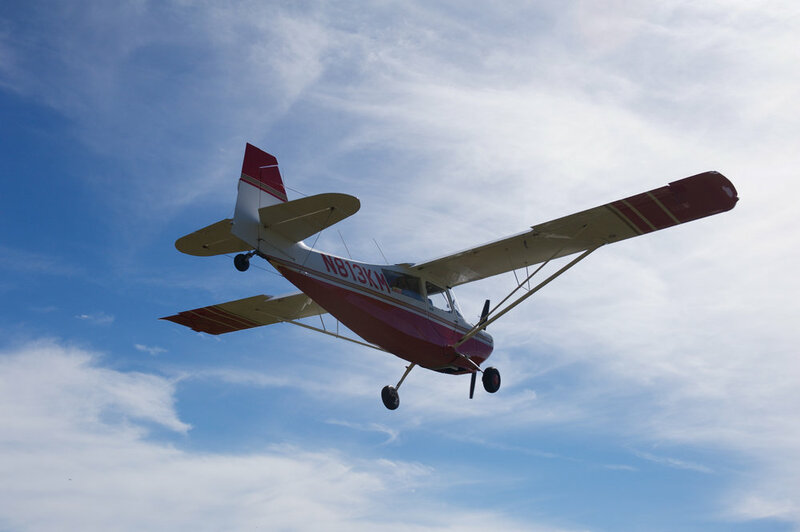 In Florida as on Martha's Vineyard, we also provide both private tailwheel training and endorsements in the Citabria as well as check-outs in the Bird Dog. The weather is great for flying and we can schedule your sessions to fit your schedule. Some students and pilots schedule a break from the winter weather and head south to spend several days flying with Paul in Florida. Plan now to get some tailwheel experience at Massey Ranch. Use map for directions to Katama Airpark. Use map for directions to Massey Ranch Airpark. Tailwheel training at your location (anywhere in North America) in either your airplane or mine. "Have airplane will travel." TO contact Paul directly, call (401) 487-7733 or simply fill out the form below for more information about learn tailwheel.